If you read this blog much you will notice we are big on posture because there is strong evidence that associates poor posture with spine related conditions and poor health. In fact many of the papers I have read, including surgical and non-chiropractic studies, all indicate that improving posture should be an outcome in treating patients with spine condition. In a recent post here I mention a number of papers that conclude that improving posture is important for improving longevity and quality of life as we age. The importance we place on posture correction is not misplaced, improving your posture is an important part of a healthy lifestyle. We have over 100 hours of postgraduate education regarding posture and posture correction procedures. Since 2006 we have had great success with improving strength, flexibility, balance and restoring posture. Browse over to our success stories page to see a few before and after care cases. If you want to look into your posture, how it fares compared to normal, and if you should do something to restore it; you should give us a call. We offer free consultations which include a brief discussion on your concerns about your health and how we might be able to help. 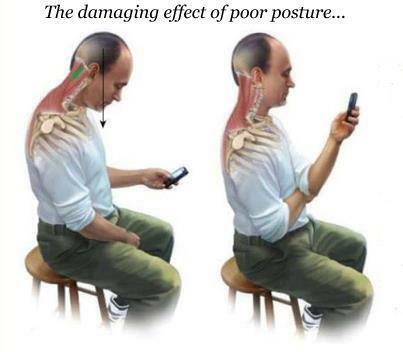 If you are wondering what to do with your smartphone, use it with upright, good posture. You might look a little odd, but better look odd than engage in a behavior than can lead to poor health.